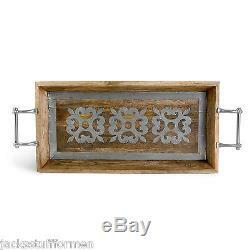 Heritage Mango Wood Rectangular Tray with Metal Inlay. Sustainable Mango Hardwood with Aluminum Inlay Dimensions. 30in long x 12in wide x 5in high. Item #: 92762 Additional Quantities May Be Available. The GG Collection is well know for setting the standard for authentic, beautiful and functional kitchen tableware and accessories. Both casual and elegant, it is characterized by warm hues, a mixture of mediums including glazed ceramics, mouth blown glass and hand finished aluminum accents that create the "GG" look. GG ceramic pieces are made of stoneware fired at extremely high temperatures to create harder, chip resistant clay, which provides an even heat for baking. Glazes are combined with the stoneware to create a unique finish. The occasional pinhole and color variations are considered normal and natural to the ceramists and lend themselves to the handcrafted old world look of the GG Collection. Dinnerware and serving pieces not containing metal or glass parts may be safely washed in a dishwasher using the low energy / air cycle. Bakers may be used in most microwaves and conventional ovens up to 400-425 degrees Fahrenheit. Do not take dishes from the refrigerator and place directly in a heated oven. Do not place ceramics in the freezer. GG glass items are made by a mouth blown process. There will be wavy distortion from the flow and cooling process of the glass. Occasionally small air bubbles are visible that are part of the glass making art and not considered imperfections. Hand wash glass items with a mild, non-abrasive dishwashing soap and soft cloth. Do not wash in dishwasher. Glass items are not tempered and should not be used to serve hot beverages or food. Do not place in the oven or microwave. GG metal bases and accents are cast aluminum with an applied finish. Hand wash metal items or ceramic with attached metal accents in a mild, non-abrasive dishwashing soap and soft cloth. Do not place metal items or ceramic with attached metal accents in the oven, microwave, or dishwasher. Caution: Over tightening screws may cause breakage. CASEL'S MARKETPLACE The Best of Everything. Since first opening our doors as a small grocery store in Atlantic City in 1929, Casel's has been a family-owned market focused on bringing the finest quality food and merchandise to friends and neighbors. Our award winning store offers the largest selection of gourmet and natural food and merchandise available. While other businesses have come and gone, Casel's continues to turn new visitors into life-long customers by combining the memories, tastes and smells of eras past with today's most exciting products from the region and around the world. We sell the best products available. We are not just an internet company... We guarantee everything we sell... The item "THE GG COLLECTION Heritage Mango Wood & Metal Inlay Rectangular Serving Tray" is in sale since Saturday, November 07, 2015. This item is in the category "Home & Garden\Kitchen, Dining & Bar\Dinnerware & Serving Dishes\Trays". The seller is "caselsmarketplace" and is located in Margate City, New Jersey. This item can be shipped to United States, to Canada, to United Kingdom, DK, RO, SK, BG, CZ, FI, HU, LV, LT, MT, EE, to Australia, GR, PT, CY, SI, to Japan, to China, SE, KR, ID, to Taiwan, ZA, to Belgium, to France, to Hong Kong, to Ireland, to Netherlands, PL, to Spain, to Italy, to Germany, to Austria, RU, IL, to Mexico, to New Zealand, PH, SG, to Switzerland, NO, SA, UA, AE, QA, KW, BH, HR, MY, BR, CL, CO, CR, DO, PA, TT, GT, SV, HN, JM.